Review Genesis Mining 2019: Scam or Legit? Genesis Mining promises cryptocurrency mining for everyone and is the market leader in cloud mining with more than one million members. But what exactly is Genesis Mining and what is behind this cloud mining provider? We dived in the world of crypto mining and looked into this provider. What can you do with Genesis Mining? The principle of Genesis Mining is quite simple: Genesis Mining provides the complete infrastructure to effectively mine cryptocurrencies. With this infrastructure you can buy a part of the hashpower. This hashpower is expressed in hashes per second (H/s), megahashes per second (MH/s) or in terahashes per second (TH/s). Depending on your available budget, you can claim an amount of hashpower. The more power you claim, the more cryptocurrency you will mine and the cheaper it gets. After you bought some hashpower the system will start automatically with mining your choses cryptocurrency. At the moment you can claim six different plans at Genesis Mining and you can mine more than ten different cryptocurrencies. The Bitcoin Mining plan is a lifetime plan, this means that the power is bought completely and not only rented for a limited time. With the Bitcoin mining plan there’s a fee of 28% that will be deducted from all the mined Bitcoins. This fee is for maintenance, hardware costs and electricity costs. This means that a part of the hashpower is used to finance the operation and thus the profit of the bitcoins is a little lower. So far, the bitcoin mining contract is the most profitable contract of Genesis Mining. Don’t get scared about the relatively high fee, because this contract is available for a lifetime. This sounds very good, but there’s abvious a catch: the mining difficulty for mining new Bitcoins is steadily increasing. If the complexity gets so high that the operation and the required hardware is more expensive than the yield of the obtained bitcoins, Genesis Mining reserves the right to terminate the contract. The advantage: There are no hidden costs, but Genesis Mining can terminate the unprofitable contract. The downside: It is not really clear in advance, how long a lifetime contract will remain. The other plans are available for two years and the advantages of these contracts is that no fee is charged for the whole contract period. With each contract/algorithm different coins can be mined. You won’t exactly mine for example Dash with SHA256 (Bitcoin contract), but the generated Bitcoin with this contract will be exchanged for Dash at the current market price. Is Genesis Mining a scam or a legit company? The problem is that even Genesis Mining can not predict how long a contract will be profitable. It is clear that bitcoin mining is becoming more and more complex and the mining difficulty is growing steadily. The more hashpower is provided to Bitcoin mining, the faster the Difficulty grows. And the Bitcoin / USD rate has also an impact on the profitability of this operation. The operating costs fee are paid in US dollars. Thus, as the complexity increases, but the bitcoin-US dollar exchange rate continues to increase, it can continue to be bearable. Nor can this be predicted by Genesis Mining. Everyone has to decide for himself whether he wants to take the risk and wants to be part of the Bitcoin era. Just as it was 150 years ago during the Californian gold show, it was a gamble to become a gold digger and to earn money by digging. Who were the real winners at the time? Only a few gold diggers were rich in gold rush. Most who found gold invested this directly back into goods. A high price had to be paid for shovels and gear at that time. Also, anyone who borrowed money had to pay horrendous interest of up to five percent a week. Traders and merchants were among the winners of the gold rush. The same parallel can be drawn to the present time, but the equipment has been changed: It is no longer necessary to invest in shovels, but now in hashpower. Whether the story remains repeated. Genesis Mining is, in our opinion, not a fraud. The company presents real mining facilities in Iceland. The data centers are operated in Iceland, since the weather is particularly favorable and thus the operating costs can be kept as low as possible. This is also proof that Genesis Mining does a lot to ensure that the prospecting is as profitable as possible, but no one will be able to give a guarantee. Note: We did not visit the data centers ourselves, but use only the information provided by Genesis Mining. Conclusion: Genesis Mining is not a fraud, but investing money in hashpower and/or in cryptocurrencies is at high risk. The capital can lead to a total loss, which means that the purchased hashpower will never profitably profit. Ultimately, everyone is left to decide whether to enter the gambling game – because even with bitcoin mining, it is no different from other money investments: Where the big money lures, the high risk is not far. Which cryptocurrencies can be mined with this provider? As we mentioned earlier there are six different plans you can choose. The availability of these plans can be limited throughout time. 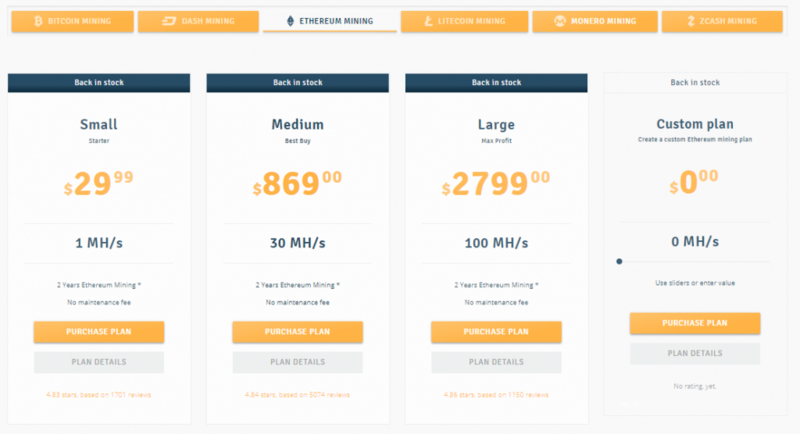 You can choose with each plan which cryptocurrency you want to mine. Bitcoin is the first, most popular and most commercial cryptocurrency of them all. An “open ended contract” applies to all plans, ie the agreement has no fixed end. This is because the difficulty of the Mining and the exchange rates between Bitcoin and Dollar can not be foreseen. Therefore, they can not specify exactly how long a contract will be profitable for both parties. At all prices, there is a maintanence fee, a fixed charge for electricity and hardware of 28% used for mining. The difference here is that the contract has a fixed term and no further maintenance fees are charged. The contracts are valid for 24 months. You can simply choose how much hashpower you want or you can choose for a a special plan. The Ethereum contracts also run for 24 months. These are divided into Small, Medium and Large. If it isn’t possible to mine Ethereum, because it is switched to Proof of Stake, Genesis Mining will change the algorithm to the best profitable algorithm. We think that this will be the X11 algorithm. These contracts will run for two years and no fees will be charged. You pay via credit card (Visa and Mastercard) or via the following cryptocurrencies: Bitcoin, Litecoin, Dogecoin and Dash. Under the tab Mining Allocation in your Genesis Mining dashboard you can choose which cryptocurrency you want to mine. At the moment you can mine: Bitcoin, Ethereum, Monero, Litecoin, Dash, Zcash, Ethereum Classic, STEEM, Augur, Unobtanium, BitcoinDark, Doge, Zetacoin, Startcoin, Peercoin, Namecoin and Curecoin. Every day when the payment limit is reached, you will be paid out in the chosen cryptocurrencies. If the payment limit is not yet reached, the payouts will be added together until this limit is reached. In the dashboard, you can keep track of your payments and how much has been paid out. You can also see the transaction hashes and to which wallet your payment is sent. Did you know you can get an extra discount if you use a promo code? We have a special Genesis Mining promo code for you available. If you use this code you will get a 3% discount on every contract. Don’t get fooled by other websites who promises you a higher code than 3%. The code can be re-used and shared with friends and family. The promo code is valid for all contracts and can be used multiple times. Try it again when it says promo code invalid. Genesis Mining offers a very user-friendly and legit portal where you can start mining cryptocurrency without any technical knowledge. Profitability depends on the specific coin, the value of this coin and the current mining difficulty. In general, a return on investment can be reached within 8 to 10 months, after you reached your ROI your income will be pure profit. Customer service responds very quickly, even during busy periods.